A power tool like the ExacTrack 20V 6-1/2” Circular Saw can open up a lot of possibilities for DIYers and professional tradesmen. It can be used for a range of different projects, and with its superior design, it can help to make much of the work easier. That being said, you need to know some of the best tips and techniques for using a circular saw before getting started. Even if you are working with the best compact circular saw, the skill and technique of the operator is going to make a difference. To start, you are going to want to know all of the best practices for circular saw safety. Beyond that, you also need to know how to use a circular saw in a way that will provide the best results. For DIYers who want to get the most out of tools like the 4-1/2” WORXSAW Compact Circular Saw, here are 10 tips for using a circular saw. When it comes to how to use a circular saw, you’ll learn everything from setting up the saw position to making the actual cuts with and without a sawhorse. So many people make the mistake of just setting the blade to its greatest depth and using it like that for every cut. While this may seem more convenient, it is going to affect the quality of your cuts and can increase the risk of injury. Before you start, unplug your corded circular saw and line the blade up with the edge of the piece you are cutting. Use the levers or knobs to adjust the blade to about 1/4” past the depth of the wood. That should be enough to make your cuts, and it will limit the amount of exposed blade while you are cutting. If it is at all possible, you want to work with the motor of the circular saw facing the larger supported section of your workpiece. When you cut from this position, it ensures that the shoe will continue to be supported even after the cut starts to fall away. This isn’t as much of an issue with compact circular saws, but it will make it easier to maintain control of tool as you finish the cut. When learning how to use a circular saw, you want to make sure the cut piece can move away freely when the cut is complete. If the cut piece is not free to fall away or move free of the saw, it can bind on the blade toward the end of the cut. This could make the saw kick back. If you have a table saw, it should be your tool of choice for making rip cuts. Along with your standard table saw, the BladeRunner Portable Table Top Saw can also work well for ripping wood. If you don’t have a table saw, it is possible to get the job done using a circular saw. You just need to follow the correct techniques for making rip cuts with a cordless or corded circular saw. The first tip for making a rip cut is to secure the board by tacking it to your clamping sawhorses. Once you have the board secure and marked, you can then use your finger to guide the saw straight through the cut. Just pinch the edge of the shoe between your thumb and forefinger and then let your finger slide down the edge of the board as you cut. You just need to make sure to start your grip before you start the cut and continue to hold it until the blade stops spinning. Of course, it’s essential to take all necessary safety precautions when making rip cuts. Wear a thick pair of work gloves, stand off to the side of the blade, tie hair back, and wear safety glasses. It’s also a good idea to roll up any loose clothing while you’re using your circular saw. Alternatively, you could set your board up on a work table and feed the wood through with push sticks when you’re first getting the hang of rip cuts. A piece of plywood needs to be supported its entire length when making a crosscut. Otherwise, you run the risk of damaging the board’s veneer or having the circular saw blade catch as the cut piece starts to fall away. If you are working with a sawhorse like the Pegasus Folding Work Table & Sawhorse, you can provide the necessary support by using a pair of 2x4s to span the distance. One of the good things about using a circular saw is that you can angle the blade to make bevel cuts. However, one issue is that the blade guard can catch on the wood as you start your cut. To prevent this from happening, hold the blade guard up until you get an inch or two into the cut. Once you have the cut started, you can then release the blade guard and continue working. It might seem like a good idea to support both ends of the wood as you cut, but this can actually make it harder to operate the saw. If the board is supported at both ends but not in the middle, it will start to bow inward as you near completion of the cut. If the wood pinches the blade, it could make the saw buck. This not only increases the risk of injury, but it could also ruin your cut. In some cases, it might be better to use your circular saw without a sawhorse. If you need to make cuts without a work support, you can lay a sturdy, stationary surface under the material while making cuts. Common makeshift cutting surfaces include bricks, cinder blocks, 2×4’s, and other materials often found in a toolshed. It’s still important to make sure that there is at least a foot between your cut and yourself, even when balancing material on a surface like this. You can then line your circular saw up with your mark and let gravity help you move the blade through the wood. When you are learning how to use a circular saw, it does take some practice to get good at cutting in a straight line. If you do happen to lose your mark, don’t try to turn the blade back to the line. Instead, you want to stop the saw, let the blade stop spinning, remove it from the cut, and start again. If you have a project that requires multiple pieces of plywood cut to the same size, you can use gang cutting to save yourself time. With this method, you want to stack the pieces of plywood up making sure they are perfectly aligned. Once you have them stacked and lined up, you can then use clamps to hold them in place. 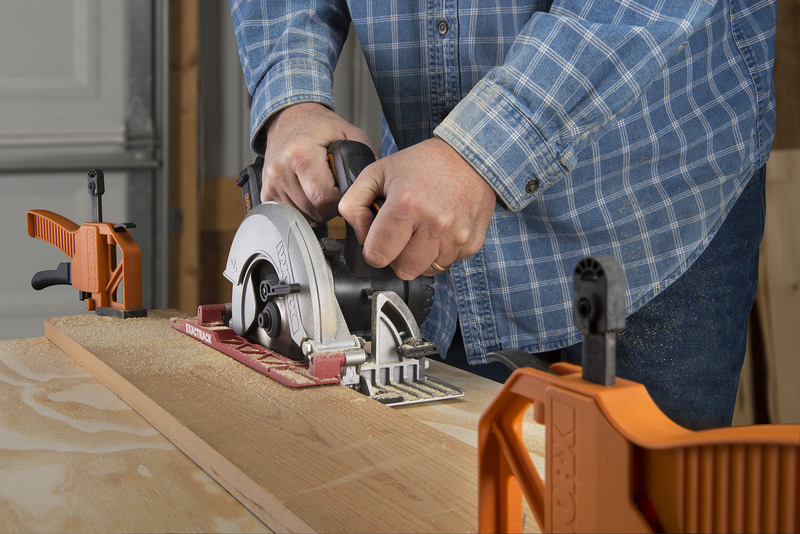 With the pieces stacked, clamped, and supported, you can then use your cordless or corded circular saw to cut more than one piece at a time. Using a circular saw can help you save time and effort on a wide range of projects. Learning how to use a circular saw is also much easier than one may expect. This versatile tool is a great addition to any toolkit, and the best compact circular saws are reliable and long-lasting. Shop the best compact circular saws for every job at Worx! When it comes to how to use a circular saw, you’ll learn everything from setting up the saw position to making the actual cuts with and without a sawhorse.